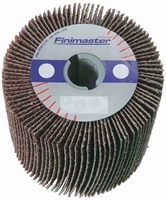 Applications: FMLA abrasive flap brushes designed for use on the Finimaster I, POLY-PTX and Flex LP 1503 hand held polishing machines with 19mm shafts. (Will also fit Metalbo S18LTX and Fein WPO 14 ranges with the adaptors fitted.) Coarse grades are ideal for cleaning, whilst finer grades will leave a brushed finish, depending on the grade selected. Product Notes: Brushes are size 100mm diameter and are available in widths of 50 and 100mm with 19mm keyway. Grades are available from 40 to 400 grit. We normally keep stock of wheels from 40 to 120 grit with finer grades available on a short lead time, however if you wish to achieve a finer finish, eg satin, we recommend the use of a non-woven type FMTA wheel. Also Available: For cleaning and finishing we also stock combination FMCA wheels. For fine finishing, such as satin graining non-woven abrasive FMTA wheels are stocked.